The U.S. Green Building Council and Ember Strategies recently released the results of a deep dive study into the design energy efficiency of a decade of LEED buildings (PDF). Ten years of LEED data shows the evolution of the best in the architecture, engineering and construction industry — and a few industry quirks — as they strive for more efficient building designs. Buildings are certified at varying levels in the Leadership in Energy and Environmental Design standard — from basic Certified to Silver, Gold, and Platinum — based on the number of points they earn across the categories of green building, such as energy, water, indoor environment, location and materials. Having a LEED certification is one way commercial real estate owners prove their building is one of the best in the world as they work to attract tenants. This study looked at the New Construction rating system for building design and construction and specifically certain energy efficiency related credits. Before digging in to the data, it is important to understand that a LEED rating system is born, grows and eventually dies and is replaced by a new rating system. This is unlike a building code or standard. The LEED rating system is tweaked in each version to raise the bar for achievement, of course, but also to try to fix credits that just aren’t working. If no one achieves a credit, there is no environmental benefit to having it. USGBC uses feedback from the market to improve the rating system over time. The study was released at the ACEEE’s 2014 Summer Study on Energy Efficiency in Buildings, the biennial gathering of building efficiency nerds in Pacific Grove, Calif.
One might expect that as the number of LEED certified buildings has grown, relative efficiency achievement would decrease, but that does not appear to be the case. The chart below is fairly characteristic of LEED rating system growth, by certification level (Certified, Silver, Gold, Platinum). The average design efficiency stays remarkably consistent at around 27 percent better than would have been required in the absence of LEED. Over the years, the industry produced more green buildings at all levels, not just at the minimum specification. One might expect that design teams become good at creating LEED Gold buildings, for example, and then eschew energy efficiency points in favor of cheaper or easier options as a rating system ages. This does not appear to happen. The charts show design efficiency of certification levels over the life of a rating system, and achievement is remarkably consistent. 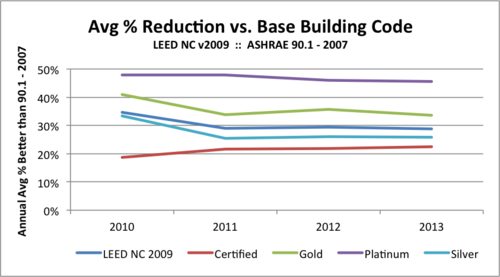 The market does not deliver less efficient LEED buildings as the years progress. On the other hand, the market also does not deliver more efficient LEED buildings with time. The success of a building design in terms of energy efficiency is generally assessed by how much more efficient the design is than what was required by the most stringent energy code at that time. This difference determines how many LEED points are awarded for energy efficiency. Building energy codes get updated about every three years, and then become the baseline for the associated versions of LEED (a relationship that will expand to other categories thanks to the ASHRAE ICC, USGBC agreement). This moving baseline makes it difficult to track industry improvement over time, but it’s not impossible. If we look at the percent by which LEED buildings in different rating systems beat the code, we see consistency within rating system versions and within certification levels. According to the Department of Energy, each new energy code baseline is a big jump in efficiency over the old. Because the code is different for each building, it’s impossible to say exactly how much better this group of buildings is than code, but we at least know that 29 percent better than the 2007 baseline is much better than 27 percent better than the 2004 baseline, and so on. 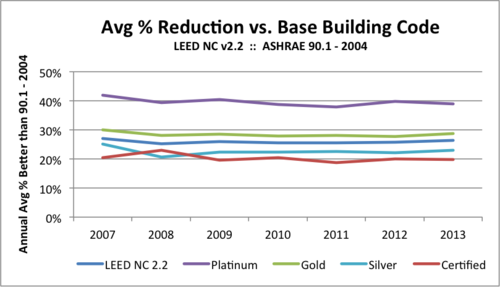 We know that average design efficiency of LEED v2009 buildings (about 29 percent better than the 2007 code) is much better than average design efficiency of LEED v2.2 (about 27 percent better than 2004 code), which is better than the average design efficiency of LEED v2.1 (about 37 percent better than 1999 code, for the buildings that earned the credit). LEED asks those designers to do better than they were otherwise required to do, and these improvements are the results. A Prius with four flat tires does not get very good gas mileage, and neither does a poorly operated LEED building. 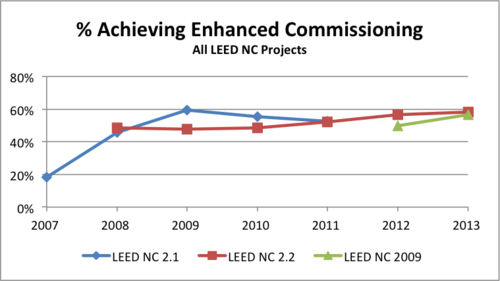 Unfortunately, the data shows that fewer LEED buildings in LEED v2.1 and LEED v2.2 than desired achieved the credits that help buildings realize their design potential. Buildings that have a measurement and verification plan will earn the M&V LEED credit and should be more likely to identify and fix problems with their facilities. In v2.1 and v2.2, only about 20 percent of projects earned the credit, but in v2009, that rate doubled. What happened? USGBC increased the point value of the credit, and the market responded. It would seem there is a lesson to be learned there. Another crucial credit to help buildings to reach their potential is enhanced commissioning, or having a third party check all the building systems in operation. While all LEED buildings get basic commissioning (it is mandatory), there is a voluntary enhanced commissioning credit for those that go above and beyond. Nearly all buildings would benefit from enhanced commissioning, but unfortunately only about half of LEED buildings in all the rating systems have done it. 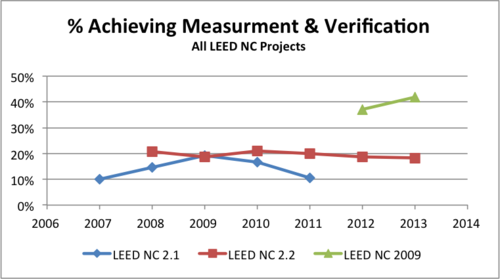 Learning from LEED v2009, USGBC has decided to triple the point value of a significantly reworked credit in LEED v4. In this case, bribery (with LEED points) may be the best policy. The LEED credit achievement data is a treasure trove of insight into how we design and build our buildings and what motivates building professionals to do better. USGBC is working to make more of this information available through the Green Building Information Gateway, where it is mingled with ENERGY STAR certifications, Living Building Challenge certifications and building energy benchmarks from cities that enable it. In the data, there are answers to countless questions about the evolution of the green building industry over time. Questions about renewable energy, use of sustainable materials, location efficiency, water efficiency and so forth are just the start. Top image of LEED-Certified Editora Abril building in São Paulo, Brazil by Paulisson Miura via Flickr. The original version of this article appeared at Ember Strategies.